Industry and University representatives, family, and friends were on hand for the Maryland Engineering Research Internship Teams (MERIT) and Training and Research Experiences in Nonlinear Dynamics (TREND) Annual Fair at the Jeong H. Kim Engineering Building on Friday, August 10. MERIT and TREND constitute a unique, 11-week summer research program that offers top undergraduate engineering, mathematics and physics students from around the country the opportunity to engage in cutting-edge, team-based, cross-disciplinary research projects at the University of Maryland. The summer program culminates in the MERIT and TREND Fair, a half-day program that provides student teams a chance to showcase their work to a wider audience, and to be judged on the quality of their research efforts. Student projects were scrutinized by an independent panel of judges. MERIT students worked primarily on projects related to electrical, computer, and telecommunications engineering, while TREND students worked primarily on projects related to nonlinear dynamics and physics. Earning the best presentation award for MERIT was Malcolm Taylor, of the University of Maryland Baltimore County. Malcolm conducted his research on "Lightweight On-Chip Operand Decoding To Aid in Information Hiding." The goal of this project was to design a small footprint chip add-on to extract hidden information so that it can be used for security purposes. His advisors were Prof. Min Wu, Prof. Gang Qu, and graduate student Ashwin Swaminathan. Winning first place overall for MERIT was Christine McKay for her research project, "Forensic Analysis of Cell Phone Cameras." This research applies to law enforcement and intelligence operations in differentiating between camera-, scanner-, and computer-generated images and determining the brand/model of the device used to capture an image. Further, this research is useful in identifying image tampering and patent infringement. 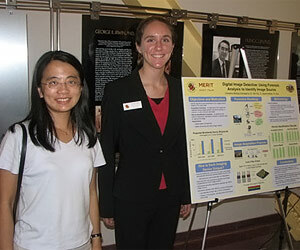 She was also advised by Prof. Min Wu and graduate student Ashwin Swaminathan, as well as graduate student Hongmei Gou. Receiving honors for TREND presentations were John Platig of Wright State University and Rose Faghih of the University of Maryland for their project "Kuramoto Model with an External Forcing Input to the Coupled System," Zhigang Pan of the University of Maryland Baltimore County for his project "Diffusion: The Key in Understanding Why Photocathodes Die," Nicholas LeCompte of Worcester Polytechnic Institute for his project "Electrodeposition of Copper with an Alternating Electric Field," and Caitlin Williams of Grove City College for her project "Dynamics of Cross-coupled Semiconductor Lasers with Time Delays: Experimental Observations." This year, 12 students participated in the MERIT program and 10 participated in TREND. In addition to University of Maryland students, MERIT and TREND participants included students from Yale University, Case Western Reserve University, Andrews University, University of Portland, Clarkson University, University of Miami, University of Maryland Baltimore County, Worcester Polytechnic Institute, Mount Holyoke College, Wright State University, Grove City College, and New Jersey Institute of Technology. For more information about the MERIT program, please visit www.ece.umd.edu/MERIT.